The Lankavatara Sutra is one of the most important sutras (sacred texts) of Mahayana Buddhism. According to tradition, these are the actual words of the Buddha as he entered Sri Lanka (formerly called Ceylon). This sutra figured prominently in the development of Chinese, Tibetan and Japanese Buddhism. It is the cornerstone of Chinese Chan and its Japanese version, Zen, and was translated from Sanskrit into Japanese and English by the foremost exponent of Zen, Daisetz Teitaro Suzuki. The most important doctrine issuing from the Lanka is that of the primacy of consciousness, often called simply «Mind Only», meaning that consciousness is the only reality. The sutra asserts that all the objects of the world, and the names and forms of experience, are merely manifestations of the mind. It is the erroneous concept of subject/object that ties us to the wheel of rebirth. terrestrial or transformational dimension, ( = Sanskrit nirmanakaya) — The dimension of Buddhahood to which the unenlightened have access, and where the phenomena of the world exist. 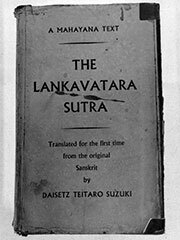 Lankavatara Sutra, translated into English from the Sanskrit by D.T. Suzuki. Boulder, CO: Prajña Press, 1978, ISBN 0877737029, first published Routledge Kegan Paul, 1932. The Lankavatara Sutra at the Buddhist Information of North America website.